By Ora Coltman. Printed in the Cleveland Plain Dealer on January 31, 1897, on page 20. As I mentioned before, I'm curating an exhibit on I.T. Frary for the Cleveland Artists Foundation. Recently, a colleague brought to my attention a watercolor painted by Frary, in 1897. 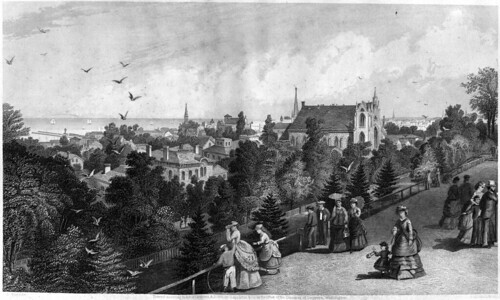 It depicts a backyard scene in Zoar, Ohio. Note: I have since learned that the painting is dated 1898. While this does invalidate some of the guesses made below regarding what Frary might have done that summer, it does not diminish the value of this information with regard to his career as a whole or to his associations with the individuals. It also doesn't affect the description of the events of that summer. One might guess that the work produced as a result of the summer of 1897 caused him to visit Zoar the following year. Zoar is a small community, located on the Tuscarawas River, about 75 miles south of Cleveland. It was founded early in the 19th century by German separatists and long retained a communal lifestyle. 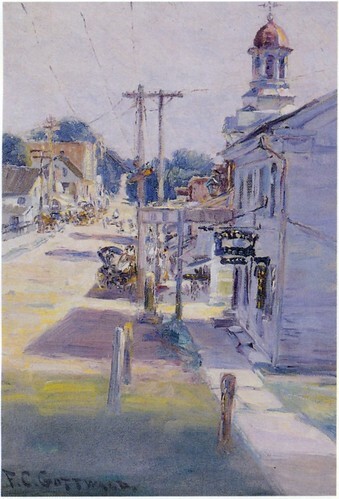 It still has an "Old World" feel that made it a popular destination for artists. I wanted to learn more about this painting. Who might Frary have visited Zoar with? Might I be able to locate their paintings, to provide some context for this one? This article, alas, does not include an image of Frary's painting. That will have to wait for the exhibition at the Cleveland Artists Foundation, which opens June 3. Evening in Zoar by F.C. Gottwald. Printed in the Cleveland Plain Dealer on January 31, 1897, on page 20. It was common for teachers to take groups of students to this or that desirable rural location during the summer. While they were sometimes called "schools", they were usually informal gatherings. 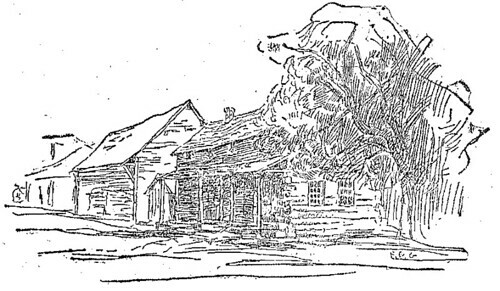 A Typical Zoar Cottage by F.C. Gottwald. Printed in the Cleveland Plain Dealer on January 31, 1897, on page 21. The story, of significant length, ran with the banner I led this story with. Illustrations of Ora Coltman and F.C. 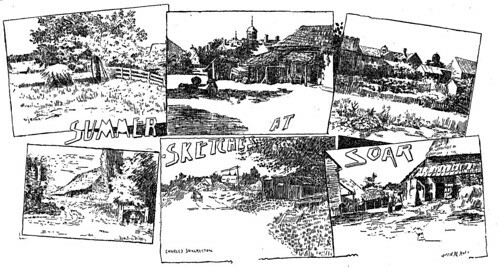 Gottwald's work depicting the rural nature of Zoar was scattered across the pages. A large number of Clevelanders made their way to Zoar that summer. At least a hundred were present in Zoar, per the hotel register published in the Plain Dealer on August 8. (page 5) Not all of these were artists, of course - some were simply there vacationing. This image contains the work of the following artists, as seen clockwise, from upper left: T.J. Ritter; May F. Sanford; [unknown]; Lottie Hoff; Charles Shackelton; and Mary E. Willson. Published in the Cleveland Plain Dealer on October 24, 1897, page 13. The Neighbors by F.C. Gottwald. Printed in the Cleveland Plain Dealer on September 12, 1897, on page 22. What does this all tell us about I.T. Frary and his participation in the school? Why, if he painted this while the class was at Zoar, was he not in the exhibit? It's quite possible that he simply wasn't able to devote the same amount of time to the class as the other students. Or perhaps he visited briefly with some of these artists. These individuals were, at the very least, associates of Frary. It's reasonable to make some connection between their work. Further, by 1900, F.C. Gottwald's studio was in the building of the Brooks Household Art Co., were Frary was a designer. (Plain Dealer, April 15, 1900, page 29) If his studio was, in fact, in that building in 1897, Gottwald might have encouraged Frary to visit Zoar that summer. There's a certain amount of conjecture here, I will admit. This is not an attempt to carve any facts in stone, but to generally illustrate a group of associates at a certain point in time. 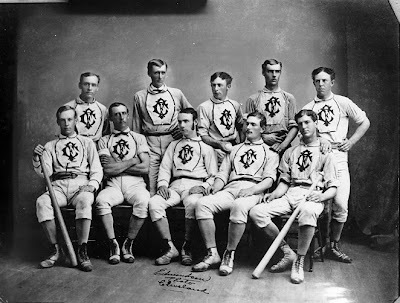 On St. Patrick’s Day, 1871, nine base ball clubs gathered at Collier’s Pub in New York City to form baseball’s first major league, The National Association of Professional Base Ball Players. The league was comprised of all professional clubs, for the first time in baseball’s history. Prior to this historic event, clubs were mainly amateur until 1869. 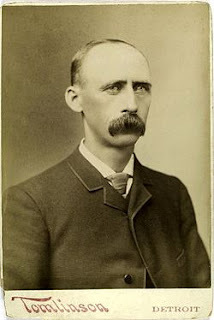 From 1869-1871, the National Association of Base Ball Players allowed a professional and amateur category for clubs. By St. Patrick’s Day, 1871, the professionals made a clean break from the NABBP, forming the first professional major league. Of the nine club’s Cleveland’s Forest City club was a member. The Forest City Club, which was originally a cricket club that played at old Case Commons, was the areas prominent base ball club since the mid-1860’s. 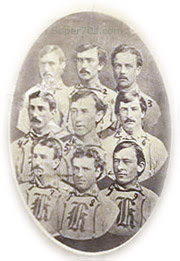 They had been members of the NABBP since they were an amateur club, and, in 1871, were entering their first season as an all professional nine. Pitcher “Uncle” Al Pratt, catcher Deacon White and Right Fielder Art Allison were their club leaders. The Forest City Club was slated to start their season on May 4, 1871, against the Ft. Wayne Kekiongas in Ft. Wayne. However, the match was not scheduled to be the first played in the new league. That honor was slated for the Boston Red Stockings and the Washington Olympics, but the game was rained out. As a result, and though neither team knew it, the Forest City’s of Cleveland and the Kekiongas of Ft. Wayne were to be the first baseball teams to play in a major league game. The game was played at Hamilton Field ballpark, land that once served a a Civil War camp, and was donated by Allen Hamilton. It was a rainy day, and attendance was low, with estimates of 200-500 people at the game. 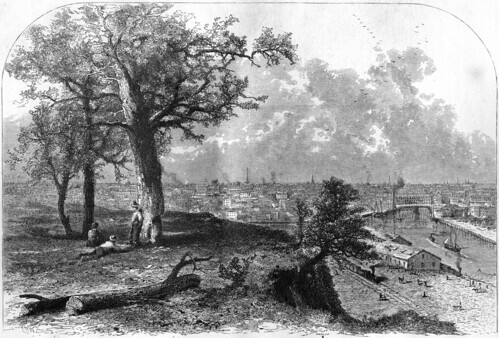 The match started at 3:00, and was umpired by John L. Bloake, of Cincinnati. Deacon White recorded the first hit and first double in Major League history in the league’s first at bat. He also led all players by hitting 3 for 4 from his lead-off spot. This combined with a solid pitching performance from Al Pratt were not enough for the Cleveland’s to prevail in the match. They fell 2-0 to the Ft. Wayne’s, and history was made. “The finest game of base ball ever witnessed in this country was played on the grounds of the Kekiongas of this city this afternoon, the playing throughout being without precedent in the annals of base ball, and the members of both clubs establishing beyond doubt their reputation as among the most perfect ball players in the United States." Overall, the game is a major first in baseball history, and Cleveland was a big part of it. Hopefully, the Cleveland’s will do better on Opening Day in 2011! A while back, I wrote about a more recent piece of this region’s built history – this house, built by Don Hisaka as his personal residence. 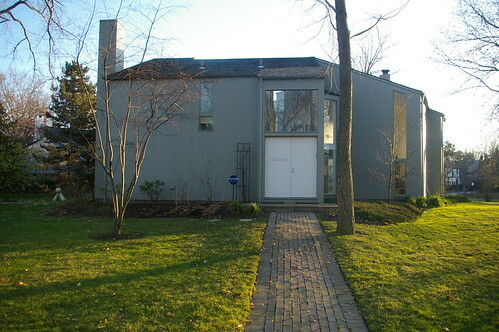 The structure, an AIA honor recipient in 1970, is located at 14300 Drexmore Road, in Shaker Heights, Ohio. The Cleveland Artists Foundation is presenting an exhibit of the structures designed during Hisaka’s time in Cleveland – 1960 – 1985. The show opens tomorrow and runs through May 21. After that date, the exhibit will travel to the Cleveland Clinic, and then, in January, 2012, to the Mansfield Art Center - a structure designed by Hisaka. Full disclosure: I’m curating the CAF’s next exhibit, set to open June 3 and running through the middle of July. 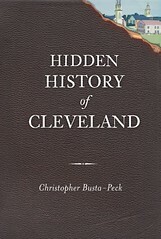 Seven of the structures in the exhibition are in the greater Cleveland area. What follows is a look at four of them. Don Hisaka's home received a national Honor Award from the American Institute of Architects. The 1970 AIA jury stated: "An interesting and difficult site, the desire to relate to adjacent homes, the need for outdoor privacy, the need for a reasonable amount of living space, and an obviously austere budget have all been brought quietly and with great delicacy into handsome balance." The two-story home is located on a triangular corner lot in Shaker Heights. Although it is a contemporary design in a traditional neighborhood, its roof-line geometry blends with homes on both sides. In conforming to strict setback requirements, Mr. Hisaka had to place his family's home in the furthermost corner of the site. Four connected blocks-three living units and the garage- almost completely surround a private courtyard. Inside the house is a world of space, light, and serenity. Every first-floor room has floor-to-ceiling glass walls and overlooks the courtyard. Architectural Forum, July-August 1969, devoted four pages to the Hisaka residence. A comment: "Even though the neighbors cannot look into the Hisakas' court, they can tell it is there, and perhaps they realize that the scheme of additive units around a court solves some of the basic problems of housing in the suburban setting. It shows one way to enjoy private outdoor living space and large glass areas - without living either in a goldfish bowl or behind a stockade." Exterior walls are rough-sawn cedar, stained to blend inconspicuously with the trees. 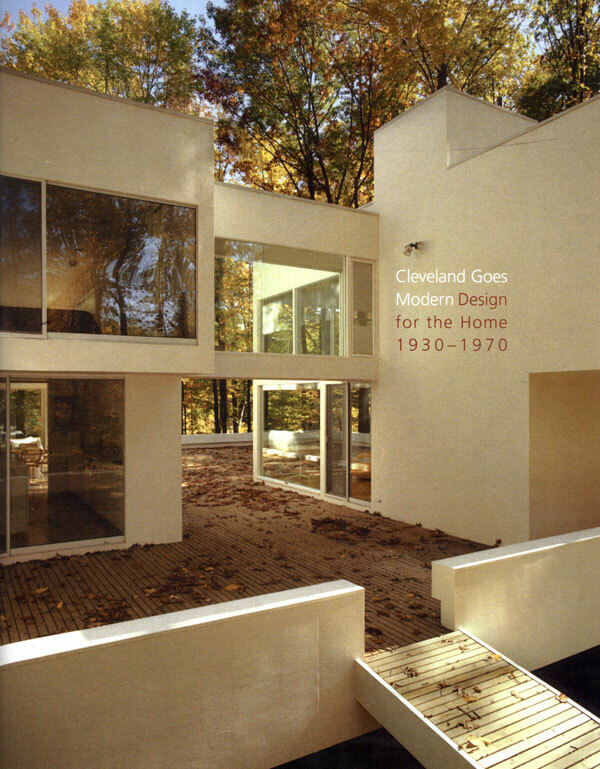 The Gund Residence, also designed in 1965, was featured on the cover of the catalog for Cleveland Goes Modern. The house is located on the south side of Major Road, between Riverview Road and Oak Hill Road, in Peninsula, Ohio. The site is not visible from the road. The Cleveland Artists Foundation, in the exhibition label, describes the challenges the site and the client presented to Hisaka and the manner in which he addressed them. The clients chose a heavily wooded site, south of Cleveland, amid slopes and ravines. Then, in discussing a holiday & summertime retreat with Hisaka and Associates, they talked about a home with large decks and an international style “treehouse” floating over a densely wooded site. They wanted a view of four small, man-made lakes and asked not to destroy a single tree. Hisaka’s solution places two stark white cubes on an expansive wood desk. The entire structure is perched on concrete stilts, and a glass-enclosed bridge connects the two-story wings. After the house was completed, the client allowed one tree to be chopped down. As a result, three of the four manmade lakes on the property and broad expanses of forest are visible from the interior of a light-splashed home that gives its residents a sense of living outdoors. Giddings Elementary School, completed in 1970, is located at 2250 East 71st Street, Cleveland, Ohio. The exhibition label describes the reasoning behind this Brutalist design. The award winning Giddings Elementary School in Cleveland has three stories of classrooms surrounding a skylit courtyard. Here exterior windows are minimized to discourage vandalism in a modern structure that replaces a burned-down 19th century schoolhouse. The new school turns inward toward the courtyard, which is enlivened with greenery, a prominent staircase and a two-story glassed-in core housing offices and a library. The mustard brick exterior steps down in one- and two-story levels to harmonize with the scale of traditional wood-frame houses in the neighborhood. When built, square lintels topped the entrances - one is seen off-center here - not unlike a brick piece of stonehenge. They have since been removed, to the aesthetic detriment of the space. The band of paint, eight or nine feet high, around the bottom of the building has not helped the appearance. The architect can accept some responsiblity for this - graffiti in this situation is almost an inevibility, and it must be painted over, as chemical and mechanical means of removal either pollute or damage the brick - it should be considered as part of the design process. Eric Johannesen, in the authoritative Cleveland Architecture, 1876-1976 selects this school as one of the best examples of its type. The text (page 233) illustrates the atrium described above and an entrance, before it was altered. I can't speak to how well the building does or does not function as an educational institution. It's worth keeping in mind that the design was a product of the times, and that the lack of windows on the exterior was meant to reduce distractions. Natural light was to come from the atrium. The presence of this building in the neighborhood could be improved by the replacement of the missing brick lintels. Compared with many other building restoration projects, the cost of this is low. Perhaps those involved in mounting the exhibition would consider donating the work and materials to accomplish it. Interior, University Center Atrium, looking south. Photograph taken in 1980 by Clay Herrick. Used courtesy of The Cleveland Memory Project. [A]n L-shaped building which joins the plaza on two sides. Lecture rooms and public functions, located on the lower three floors, are accessible to students and outsiders. Offices are on the upper three floors. Lounge and dining facilities are on the second floor, handy to the enclosed bridges which, connecting with library tower and classroom buildings, create an all-weather campus. The oblique wall at the entrance on Euclid Avenue is an invitation to pedestrians from Cleveland’s main business area, only a few blocks west. Unfortunately, while the structure was visually stunning, it was also quite unusable. It was demolished in 2008. Don Hisaka's buildings shaped, in their way, the built landscape of the greater Cleveland area. While they're not as old as the structures we usually call "historic", they've clearly had an influence. Take his house, a better answer to a skinny triangular lot in Shaker Heights than the usual boring duplex. Look at Thwing Center, at Case Western Reserve University, which brings together two historic structures. Take a look at Giddings Elementary, which might be seen as a fortress to protest those who wish to learn, while still bringing in plenty of natural light. The exhibit, Don Hisaka: The Cleveland Years, opens tomorrow - Friday, March 25, and continues through May 21. An opening reception will be held from 6 to 8 pm. The Cleveland Artists Foundation is located in the Beck Center, at 17801 Detroit Road, in Lakewood, Ohio. A catalog has been published to accompany the show. More information on Hisaka's work can be found in the CAF catalog Cleveland Goes Modern. 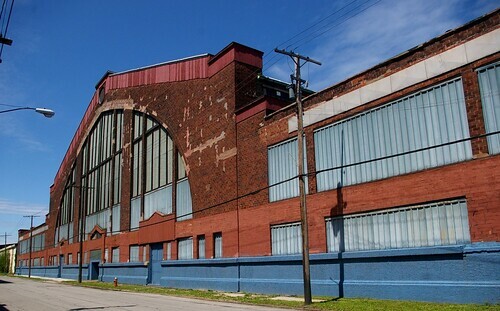 One of Cleveland's most interesting industrial structures is just off a major road (St. Clair Avenue), at the northwest corner of East 45th Street and Hamilton Avenue. It's hard to convey the size of this massive structure - 312 x 500 feet - and its design is sufficiently impressive that I was shocked I hadn't written about it previously. 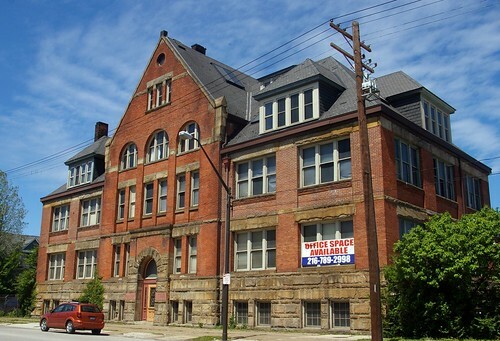 The structure, built in 1901-1902, was designed for the Brown Hoisting Machinery Company by J. Milton Dyer. It represents one of his earliest commissions. 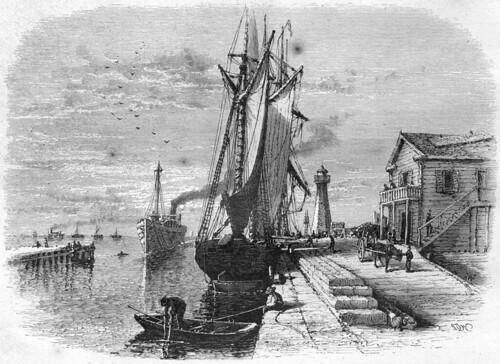 Among Dyer's significant commissions were the Cleveland City Hall, the Peerless Motor Car factory and the Coast Guard Station. 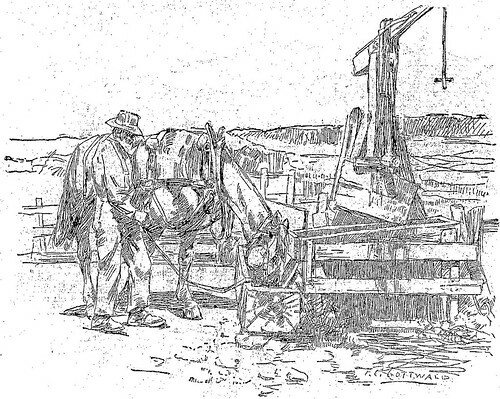 The Brown Hoist (or Brown Hoisting) Company was founded in Cleveland in 1885. They became the largest company in the world dealing exclusively in cranes and materials handling machinery, filling orders for all types of industry. In 1900, a fire destroyed the factory. Alexander Brown, vice president of the company, wanted to create a building material that was fireproof, lightweight and cheap. The process, called Ferroinclave, was first used in this building. Eric Johannesen, in Cleveland Architecture, 1876-1976 (page 43) describes the material, which "Consisted of corrugated steel sheets formed by alternating Z-angles into dovetails, covered on both sides with cement." He notes that "This idea was also the origin of the steel-formed stairs with cement treads which are a part of standard building practice seventy-five years later." The nature of the base material is illustrated here, in Brown's patent application. J. Milton Dyer was responsible for this part of the complex as well. 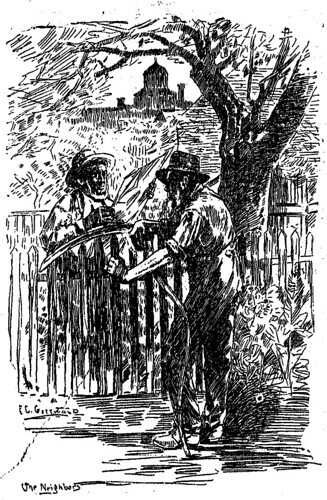 (May 22, 1902, page 14 and October 7, 1903, page 12) The contractor was one H. Scheeler. (December 7, 1902, page 16) A grand opening and dance for the office building were held on Friday, June 20, 1902. (June 21, 1902, page 3) The building, at 4403 St. Clair Avenue, Cleveland, Ohio, still stands. 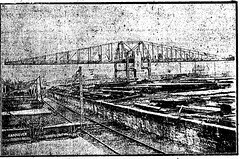 This rendering of the Brown Hoist complex was published in the Plain Dealer on May 22, 1902. 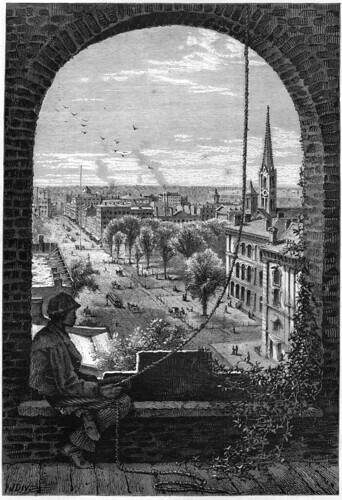 (Page 13) The artist was looking north northwest. At the far left, the office building is visible, including the unbuilt rear wing. Behind it, the drafting shop is visible, and behind that, the factory. This angle illustrates the form of the factory building in a way that my photographs cannot. 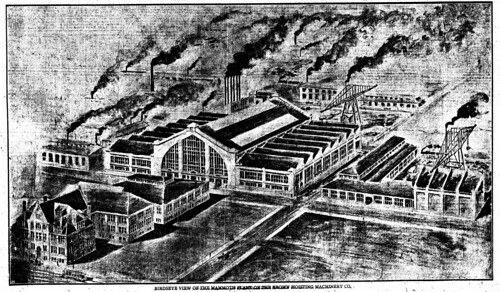 An article in the Plain Dealer on May 22, 1902 (page 14) describes the factory building. "The main shop covers about 156,000 square feet of ground, constituting one large room without a single partition. The roofs are supported by heavy steel columns placed at intervals of about forty to seventy feet. The shop is composed of seven compartments or bays, each of which is equipped with huge traveling cranes of twenty to thirty tons capacity. The entire structure has a floorspace fully double that of the old shop and it is estimated that with the largely increased facilities the annual output of the company will be three times as large as formerly." 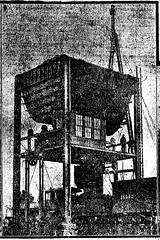 After describing the fireproof constriction, it continues "The plant is lighted by electricity, which power is also utilized in propelling the great cranes, and an improved system of heating and ventilating by underground conduits has been installed. Among the other buildings forming a part of this enormous plant may be mentioned the power house, equipped with the latest improved electric machinery; the pattern shop, pattern stores and store room. The rear yard from which shipping is done is provided with two large traveling cantilevers. The offices of the company front on St. Clair street and occupy one of the most elegant office buildings in the city." This historic structure remains in use today, as an industrial warehouse. It's an important piece of our industrial heritage. If you find yourself in the area, stop and take a look. It's impressive. I came across this photograph of the Taft Mansion (now the Taft Museum of Art) in Louis August Weber's 1947 M.A. 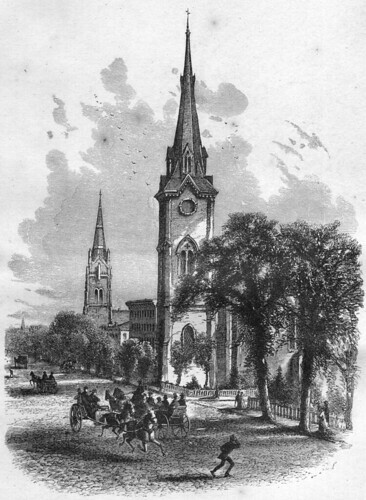 thesis, Architecture in Cincinnati Before 1845. It is used courtesy of the Ohio State University Book Depository. Weber's thesis is an impressive work. It includes almost 160 black and white images, mostly original photographs taken by the author. Weber was clearly quite skilled with the view camera - the work appears to be of quite high quality. Further, it serves as a document of many structures that are no longer standing. I'm trying to find a way to justify scanning all of the photographs, and I probably will, for my personal reference. Tying them in to Cleveland area history is a bit more challenging. 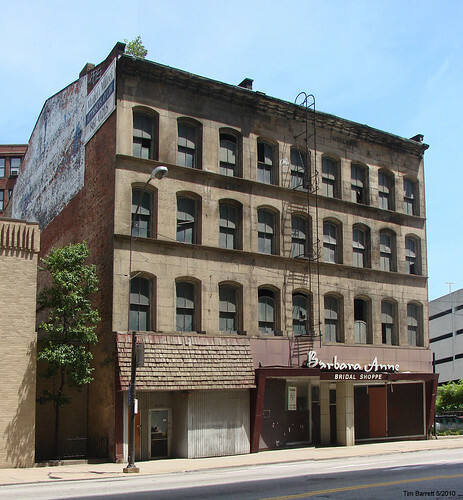 I bring up this Cincinnati structure because it reminds me of this image, of the Dunham Tavern and 6611 Euclid Avenue, the seven story industrial building behind it. 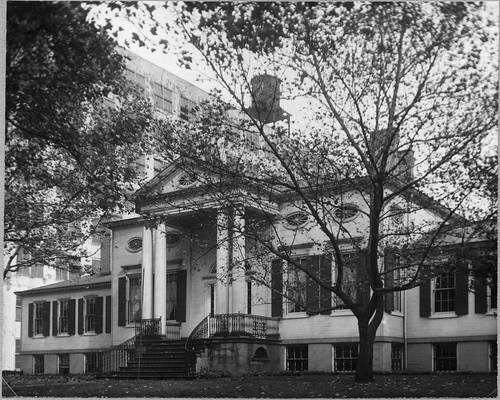 Both the Dunham Tavern and the Taft Mansion were built at about the same time. 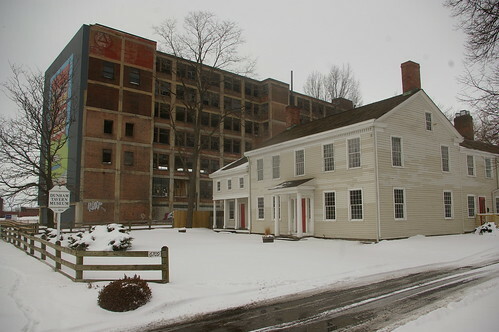 The industrial structure seen next to the Taft Mansion remains, providing historical context and illustrating how the city has changed over time. 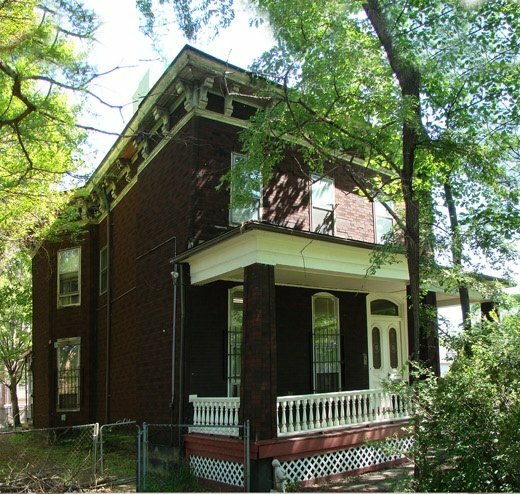 As I've suggested before, it's important that we consider retaining the structure at 6611 Euclid Avenue, as context to the Dunham Tavern Museum. The Dunham Tavern will be much less impressive as a survivor when we lose the physical manifestation of the changes that it lived through. 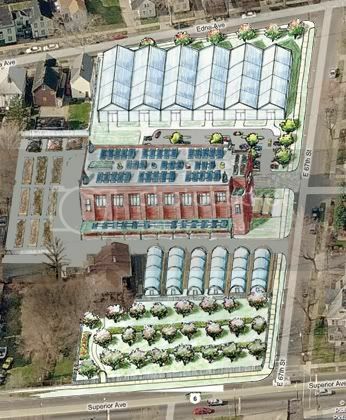 We, the citizens, own 6611 Euclid Avenue, so it's up to us to let our elected leaders know our position on this matter. It would surely be quite expensive to rehab - I dont' believe that rehabilitation is necessary. I suggest that an appropriate strategy would be to figure out how to stabilize the structure, so that it can remain a monument both to our early history and to our industrial past.